Peripheral neuropathy is an ailment that directly affects the nerves, not including the spinal cord or the brain. It is not a single disease, but a general term used to describe a variety of different disorders, caused when the peripheral nervous system becomes damaged. People who suffer from this nerve condition typically experience symptoms of burning pain, weakness, numbness, and/or a tingling sensation. The peripheral nervous system, consists of the nerves that run from the spinal cord and the brain to the rest of the body, such as the hands and arms, the feet and legs, the joints, the internal organs, and also the skin, nose, ears, eyes, and mouth. When these nerves are affected by peripheral neuropathy, it leads to pain and numbness to these areas. 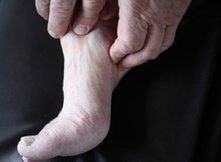 Peripheral neuropathy symptoms can begin with tingling, prickling, or numbness in the fingers or toes, spreading to the hands or feet, which can then cause shooting pain, throbbing, and freezing or burning sensations that worsen at night. For more information, please feel free to ask Dr. Jimenez or contact us at (915) 850-0900.